Industry Experts, a multi industry focused market research firm, has released an updated version of their 2009 published biotechnology market research report ‘Cord Blood Stem Cells – A Global Market Overview’. The new report reveals that the global market for Cord Blood Stem Cells is estimated to garner US$5.6 billion in 2011 and expected to touch US$7.2 billion by 2012. Advancements in science and technology have enabled in increasing the number of preserved cord blood units being used in regenerative medicine applications. Expectant parents can decide to store their baby’s cord blood in a family bank and the stem cells are immediately available for use in medical treatments, such as future therapies requiring repair or replacement of damaged heart tissues. An infant’s cord blood offers the most ideal option for congenital heart defect or for future unforeseen and sudden occurrences, such as a serious heart attack. Latest scientific evidence offered by regenerative medicine has proved that using one’s own stem cells is likely to deliver the most favorable outcomes. Cord blood stem cell technologies analyzed in this study include Stem Cell Transplant, Cord Blood Banking, Blood Transfusion, Cell Based Genetics and Xenotransplant. The report is also analyses the global market for stem cell therapeutic areas comprising Neurology, Oncology, Cardiology, Cartilage, Blood Disorders, Diabetes, Dermatology and Other. The report analyses the global market in terms of USD Million. According to the study the Cord Blood Units collected worldwide reached to over 450,000 through public cord blood banks while it crossed one million units through private banks, at the end of 2010. 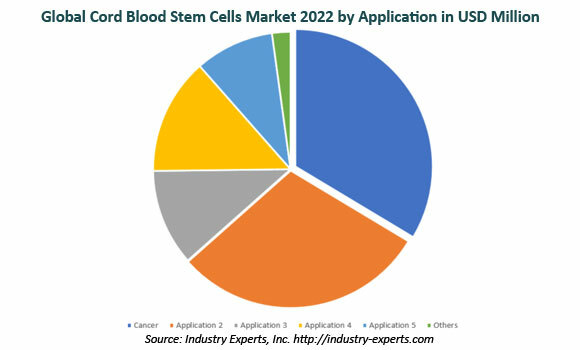 The report reviews, analyses and projects the cord blood stem cells market for global and the regional markets including North America, Europe, Asia-Pacific and Rest of World. The regional markets further analyzed for 21 independent countries across Europe – The United Kingdom, Germany, France, Spain, Russia, Sweden, Switzerland and Rest of Europe; North America – the United States, Canada and Mexico; Asia-Pacific – India, China, Japan, Australia, South Korea, Hong Kong, Singapore and Rest of Asia-Pacific; Rest of World – Brazil, Columbia, Argentina and Israel. This 282 page global market report includes 129 charts (includes a data table and graphical representation for each chart), supported with meaningful and easy to understand graphical presentation, of the market. The statistical tables represent the data for the global market value by geographic regions, cord blood stem cell technologies and therapeutic areas. The report covers the brief business profiles of 58 key global players and 86 major players across North America – 42; Europe – 13; Asia-Pacific – 24; and Rest of World – 7. The report also provides the listing of the companies engaged in collection, processing and banking of cord blood stem cells. This list also includes the companies engaged in the treatment of deadly diseases using CB stem cells. The global list covers the addresses, contact numbers and the website addresses of 295 private and 87 public cord blood banks.